Chances are, you spend more time in your bed than in any other single location in your home. The average person sleeps for about eight hours every night. During that time, your body sheds hundreds of thousands of skin cells, as well as its natural oils. Not to mention, if you sleep with a partner, you’ll both be shedding skin cells and oils on the bed every night. And, if you have a pet that sleeps with you, you’ll also have to deal with their hair and pet odor. Washing your sheets is a good place to start, but it’s not enough to keep your bed clean. Because of the amount of time you spend in your bed, your mattress will need regular cleaning to stay fresh. If you’ve never cleaned a mattress before, it can be hard to know where to start. In reality, though, it’s easier than it sounds. There are a variety of strategies and mattress cleaners you can use. Let’s look at five of our favorite ways to keep your mattress clean and fresh. When it comes to keeping your mattress clean, prevention is half the battle. Taking steps to stop your mattress from getting dirty can help extend the life of your mattress, and make it easier to clean. One of the best ways to protect your mattress is with a mattress pad. A mattress pad is a thick layer of quilted material that lays on top of your mattress but underneath your sheets. The mattress pad provides another layer of protection between your body and your mattress. It protects your mattress from spills and stains. This is important because it’s much easier to remove your mattress pad and wash it than it is to clean a mattress. A mattress pad is also less expensive to replace than a mattress is. Another added bonus of a mattress pad is that it provides extra support. This makes your mattress more comfortable. Using a mattress pad may even help protect your mattress’s warranty. We all know it’s important to vacuum our carpets. But perhaps you’ve never thought of vacuuming your mattress. Experts recommend that you should vacuum your home at least once a week. For your mattress, once a month is typically enough. That said, if anyone in your family has severe allergies, you might want to vacuum every time you change your sheets. It can be heavy and awkward to attempt to lift your vacuum onto your mattress. Instead, vacuum attachments or hand-held car vacuums tend to make better mattress cleaners. Also, if you have kids, there’s a fun way to involve them in this chore. While your children probably are not usually allowed to jump on the bed, you might want to consider a temporary lift on that ban. Bouncing on the bed can help bring dust to the surface, making it easier to vacuum. In addition to vacuuming the mattress monthly, you should take it outside at least once a year for a more thorough cleaning. This will also allow you to vacuum both sides of the mattress. You may even opt to beat it with a broomstick like your grandmother would have in the old days. If you like to eat and drink in bed, you should definitely clean it more often. The crumbs will start to build up and can attract bugs. Eating and drinking in bed can also lead to messy spills. So, in addition to regular cleanings, you should also make sure to spot and clean any stains as soon as possible. The longer a stain sits on a mattress, the harder it will be to remove. Also, set-in stains can begin growing mold and mildew. You may be surprised to learn that foaming shave cream is actually one of the best mattress cleaners. Leave this to sit on the mattress for 10 to 15 minutes. This will allow the alcohol in the shaving cream to sink into and attack the stain. Of course, food stains aren’t the only kinds that get on mattresses. If you get blood on your mattress, a solution of hydrogen peroxide mixed with water is a good way to treat it. Since you spend so much time in your bed, you want to be selective about the mattress cleaners you use. Using cleaning materials with unnatural chemicals and fragrances can irritate your skin and worsen allergies. One of the best ways to know what’s in your mattress cleaners is to make them yourself. Luckily, it’s fairly easy to make an effective mattress cleaner with supplies you have around the house. We recommend taking a cup of baking soda mixing it with five drops of your favorite essential oil. This will add a pleasant smell to your mattress cleaner, without the negative effects of unnatural perfumes. Simply sprinkle the baking soda on your bed, and let it sit for around 30 minutes. This will give it time to break down acids and absorb odors from your mattress. After the baking soda has sat for 30 minutes, you can vacuum the mattress to remove the baking soda and any residual odors. After you’ve used a mattress cleaner, it’s important to give your mattress time to air out. This helps your mattress dry out, and prevents moisture from getting trapped in it. If moisture remains in the mattress, it can lead to mold growth. To let your mattress air out, let it sit in your bedroom with the windows open. Make sure to draw the curtains so that the rays from the sun can kill any remaining germs and bacteria. 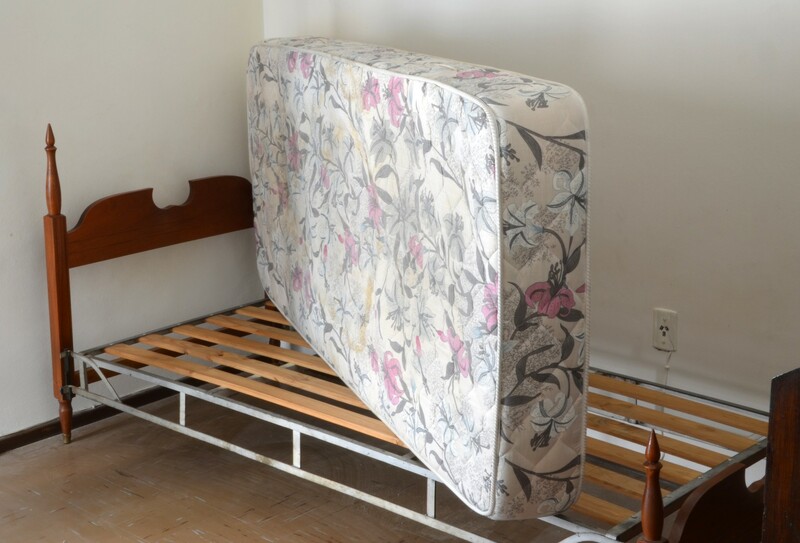 Typically, one to two hours is enough time for your mattress to air out. After that time, you can return your sheets and blankets to the bed. If you have questions about mattress cleaners or would like to schedule a cleaning, contact us. We’ll work with you to keep your home fresh and clean.